Dramafever Awards 2015 Ticket Giveaway! [Flash Giveaway] FT Island Ticket Giveaway #2! FT Island Ticket Giveaway Winners! FT Island’s LA Concert Ticket Giveaway! [Discount Tickets] 2PM Go Crazy Tour in LA! 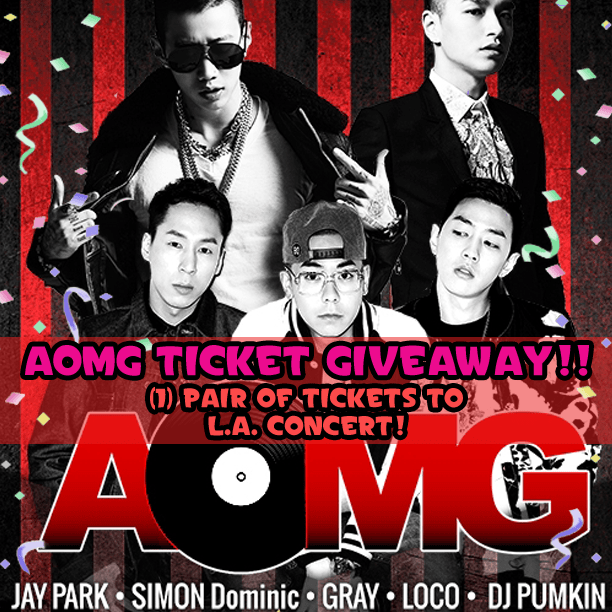 [Ticket Giveaway] AOMG U.S. Tour in LA! It’s almost time to see Jay Park, Simon Dominic, Gray, Loco and DJ Pumpkin! Nov. 14th, the stage at the Belasco Theatre in Downtown, LA will be set ablaze as these talented MC’s greet their US fans! Oh, don’t have your tickets yet? We happen to have an extra pair thanks to the Belasco Theatre, so who wants ’em???? 2) Share the contest post! We will be posting about the contest on our various social medias so all you have to do is hit the share button! Snapping a pic would be awesome so it would be easier to see it! WE WILL CLOSE THE GIVEAWAY ON MONDAY, NOV. 10th! [Ticket Giveaway] San-E and Bumkey’s Show in Los Angeles!